I always said I wouldn’t become a crazy dog lady. I wouldn’t knit my dog a sweater. When am I going to realize never say never? I am a crazy dog lady. 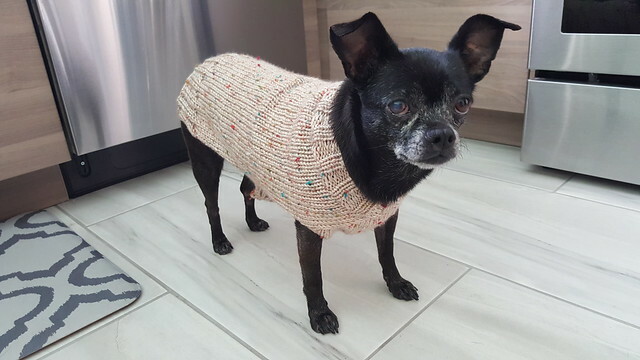 I knit my dog a sweater…and I’m going to do it again and for friends who have dogs too. 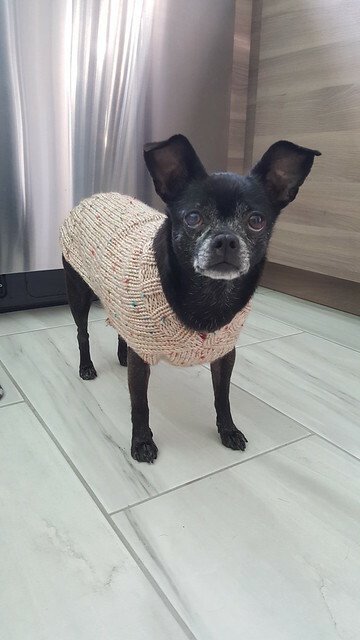 I favorited on Ravelry a while ago the Seamless Knits for Posh Pups book and I finally bit the bullet and downloaded it last Friday. 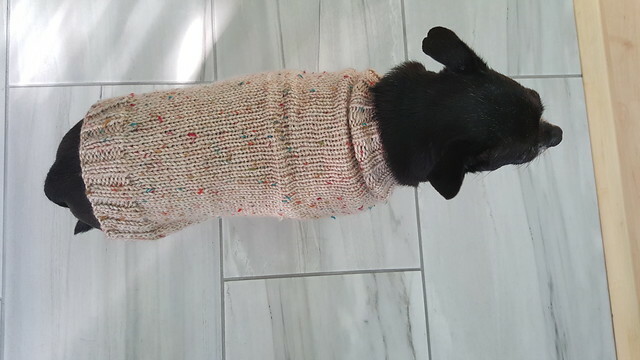 I’ve seen a lot of dog sweater patterns but I said I’d only do it if it was seamless and top down so I didn’t have to do a lot of work. I got home Friday night and decided to cast on the Sparkle sweater for Cher and by Saturday afternoon she was rocking a new sweater in the leftover yarn from my Mountain High. I think the only reason she willingly let me take these photos is because she knew I’d give her a carrot afterwards. Or she knew she was really cute. The construction was simple, top down using a worsted weight yarn. Most of the patterns are worsted/aran or bulky weight yarn – my kind of projects. I picked sparkle because it was really the simplest of sweaters and I wanted to just dip my toe into the dog sweater knitting realm. Up next I might knit the Waldo and use all of the leftover yarn to do the stripes and colorblocking. I think that’s the other great thing about this is that the sweater used a little less than one ball of yarn for the medium size on Cher (the patterns are really for smaller dogs but you can easily modify them) and I always have one ball of yarn leftover from a project and I don’t know what to make with it. So after the holidays I’ve got a few friends who as obsessed with their dogs as I am with Cher and I plan on knitting a few more of these for their pups for the winter. Any other crazy dog ladies out there? It was a quick knit, started Friday night and finished Saturday afternoon. The largest size goes for a 20 to 30lb dog but I could easily see the patterns being modified if your sons dog is bigger than 30lbs. I think Cher knows she’s cute! I didn’t know dogs eat carrots! Are they cooked? As to crazy dog lady: I can’t say until you answer this question. Will you be going out with Cher in matching outfits? Cher is rockin’ it! I have fallen in love with her!